My summer classes have just begun. I’m taking a full load in the summer since my goal is to graduate by the end of the year, so my schedule has been really intense. Basically, I’m waking up at 7am every morning, writing in the library in the morning for a few hours on my book, going to class from 11-5PM, then coming home to eat dinner, work out, do my reading/HW for the next day, and then hitting sleep. It’s been a long time since I’ve been this busy, but it feels good. The mental coaching is going well, and I’m really happy with the results I’ve been seeing my students. Once again, if you’re interested, contact me at haseebcoach at gmail dot com. Anyway, here’s the second chapter of The Philosophy of Poker. It’s a longer read, but my intention was to be as serious and thorough as possible, and to leave no one behind in my explanations. The next chapter will be forthcoming next week. I began this book by implying that the reality of poker is inaccessible to us, and that we are inescapably bounded by our humanness. But that is not to suggest that it is futile to try to understand it. On the contrary, we have no other choice but to try to understand it, as best we can, using all the resources available to us. I will begin this book then by first exploring our experience of poker “out there in the world,” the poker as we perceive it to exist. As this book progresses, I will turn more inward, to explore the interface between the mind and poker, but it is on the outside that we must begin. Since you are reading this book, I am going to assume a thorough acquaintance with elementary poker theory. The concepts I will discuss supervene on more basic ones, such as value, ranges, reverse implied odds, balance, game flow, game theory, and so on. If you do not have an active grounding in concepts, then I would urge you to go out and learn them first before trying to tackle this chapter. If you want to become a great poker player, you must learn to think like one. But ideas are meaningless if you don’t have the requisite experience and knowledge to talk about them. 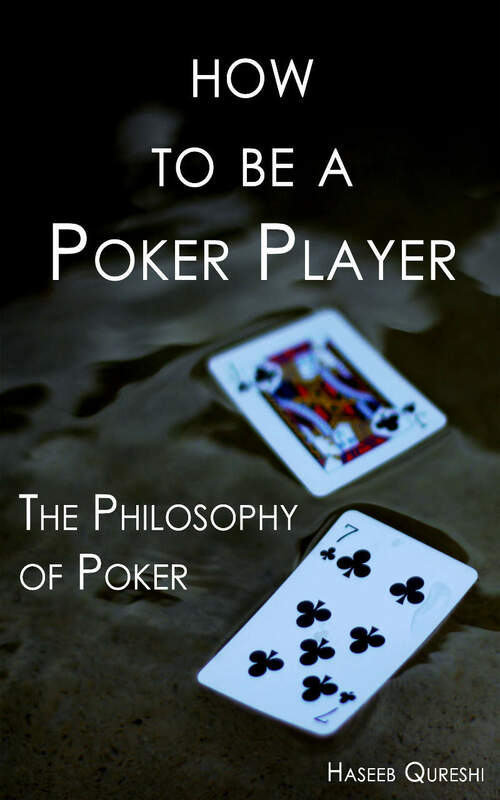 So the first step in these teachings is to equip you with the language, concepts, and perspectives with which advanced players view the game of poker. The initial shift in perspective we must make is a philosophical one. We must start to look at poker holistically, rather than reductionistically. What this means is that we want to look at poker on the whole, rather than looking at it hand-by-hand, moment-to-moment. This is the analogous to thinking in terms of ranges against ranges, rather than one hand against one hand. Allow me to illustrate with an example. There are three stages in the evolution of a player’s perception of hands. The first stage is primitive and basic, and it’s where we all begin—you take the hand you have, say top pair, and weigh it against his hand—or rather, what you think his hand is. You choose one hand that you “read,” or essentially guessthat he has, and decide what your hand should do against it. That’s the first stage, and it’s how beginners think about poker. The second and more advanced level is being able to think about how your hand is doing against his entire range in a certain spot. So you might think of how your top pair is faring against his sets, his overpairs, his top pair lower kickers, and his missed straight draws, and so on; each weighted probabilistically. The number crunching is of course only approximated, but you come up with an overall equity against his hands with which you make your decision. That’s the second level of perception, when you perceive his *range. The third level of range perception is to think of how *your range is faring against his range. This requires you not only to be able to generalize his range, but to be able to imagine and generalize your own overall strategy with all of the other possible hands you could have in this spot and how you would be playing them. But remember, when you are beginning as a poker player, you aren’t able to think in terms of more than a single hand at a time—whatever is directly in front of you is all that you’re capable of perceiving. But as you gain more experience, your brain starts to handle single hands automatically. That is to say, your unconscious mind computes the single hands, and you no longer have to consciously work out things like board texture or betting patterns. 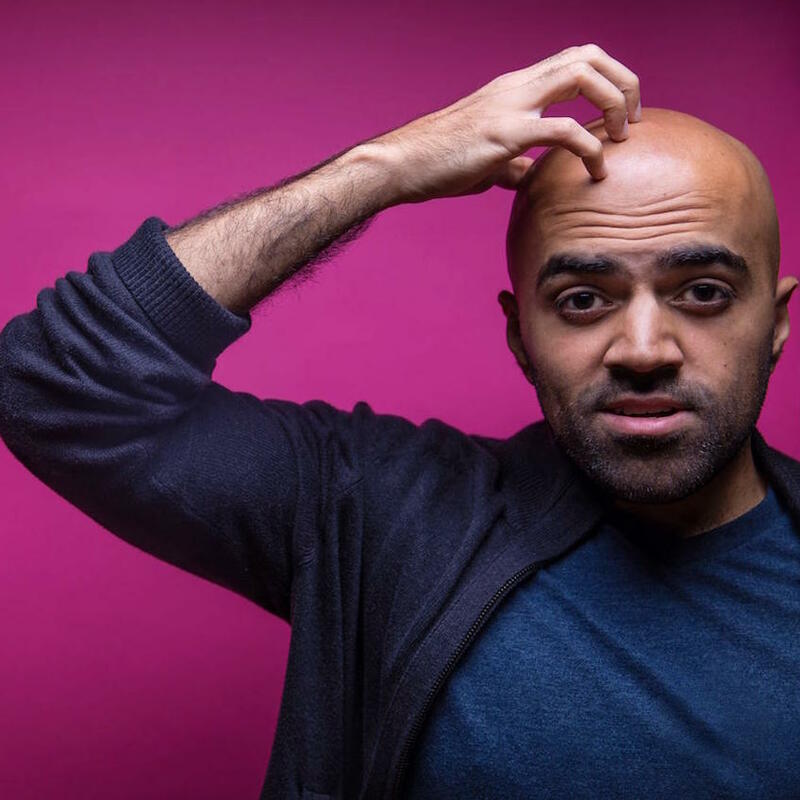 Your brain tells you automatically, call, or fold, or raise, freeing up your conscious mind to deal with higher level ideas, like ranges, exploitation, game flow, and so on. It’s a common belief that it requires a great intellect or some special genius in order to be able to hold those higher-level ideas in your mind while playing. That’s not the case at all. The only difference between someone who can and cannot do that is the amount of experience they have. Once you’ve played a million hands of poker, your instincts will be so honed that you will probably struggle not to start thinking about higher-level things, because consciously focusing on single, ordinary hands will feel like a waste of your conscious attention. So the first step is experience. Gain experience—lots of it. And once you have enough, you have freed up the mental space to think about holistic ideas while playing. First thinking about his range, and then thinking about your range against his range. Now, this is by no means to say that experience will make you think soundly—all it does is free up the resources of your mind, but without the proper perspective that won’t necessarily do you any good. Next, we must take stock of your resources—both mental and strategic. Now, I told you before that you should distrust metaphors, since they are never totally accurate. Of course that’s true; metaphors will always fall short to describe poker perfectly, just as how every schema fails to perfectly capture reality. But that being said, I am going to be using many metaphors to describe various aspects of poker to you. These metaphors will be useful, but only in elucidating one aspect of poker. Like in the story of the elephant, each metaphor may only capture one limb of the beast—perhaps just the tail, or the tusks, or the ears. But they are useful and will lend you insight nevertheless, so I want you to consider them. The first metaphor is one that will allow us to think about poker structurally. That is, it will allow us to think about poker “out there,” and for now, to simplify its interface with our minds. Consider this metaphor: poker is a ship—the kind of ship that rides on the sea. And you, the poker player, are the shipbuilder. The first thing you’ll notice is that in this metaphor, the ship is not an extension of you. It is not something internal, which exists in your mind or gut or anything like that. We want to imagine instead that poker is an external thing, an object—your object, certainly, the product of your craft and hard work—but nevertheless something that is external to you, and visible in its whole. So the first thing we notice is that our poker game doesn’t exist somewhere inside us, but instead, it exists “out there,” to be analyzed, taken apart, and put back together. The second thing we realize is that, as a shipbuilder, we have a lot of choices to make on how to craft our ship. What kind of poker game do we want to build? We look out into the sea of poker players and see hundreds, if not thousands of ships, all constructed differently, with seemingly varied ideas and intentions behind their construction. Naturally we only want to choose the best ships to emulate. So we gravitate toward things like watching videos, sweating high stakes games, reading articles by great players—and we try to fashion our ships in their likeness. But there is a fallacy embedded in this process, and that fallacy is this: no matter how many ships you look at, be it hundreds or thousands, even ships of the finest quality—no amount of looking at or studying such ships is ever going to make you able to build one of them yourself. Because looking at ships is a very different process from actually building them. And so even if you see a hundred ships which have solved the problem of how to construct a ship, how to keep it upright, how to balance the hull and the mast and the sails—no matter how many ships have accomplished this, you will still have to build your own ship which accomplishes these things. And this means you’ll have to figure out through building how to solve these problems. That is to say, in building your poker game, you are going to have to figure out and solve problems which other people have already solved. You must do more than merely emulate the surface of other people’s games, but you have to figure out whytheir games are the way they are before you can truly build a game like theirs. There is no shortcut to the art of shipbuilding. You must learn the art yourself. Now, another aspect of this metaphor is that as a shipbuilder, you have limited resources. In fact, everyone has the very same amount of limited resources. That is to say, you have the exact same resources available to you as the best player in the world. You might interject—but that’s silly! You don’t have the assets that the best players in the world have. They have all that speed, intuition, or reading abilities that you don’t. But remember! In this metaphor, you are not your ship. Your ship is external to you, and you are merely the builder. Follow me for a moment. We all get the same stack of wood—and that stack of wood is the set of all hands. We all get dealt the same hands, with the exact same frequency, and over a long enough period of time, both we and the best players in the world will get aces and kings and T9s the very same number of times. The only difference is what we dowith those hands—that is, how we use those hands to build the structure of our poker game. Your limited resources then, are good hands. Everybody gets the exact same good hands the same frequency of times. The decision is chiefly yours how you want to distribute those good hands over your flops, turns, rivers, among your flatcalls and raises and slowplays, between your small bets and overbets, etc. This is how you construct the structure of your game. Now, when it comes to exploitation, that’s where poker comes to life. Exploitation is taking advantage of weaknesses in your opponents’ ships. But you cannot exploit someone without becoming exploitable yourself. It is like throwing a punch—in order to punch someone, you have to lower your guard. And of course, you can’t win a fight by guarding forever. We might imagine something like installing cannons on this ship—in order to install a cannon, you must necessarily create a hole in your ship to fire from. And of course, that hole can also be more easily fired into. By attacking, you open yourself to weakness. This is the nature of attack and defense in all things. So we all get hands, and we must each make decisions as to where to allocate these hands in order to create the defensive structure of our games. This is the fundament of our ship, which we want to be unassailable, fortified in every direction, such that no simple strategy can hurt us (or, more likely, that the average strategy won’t hurt us). And from this point, we start opening ourselves up—creating openings from which we can attack depending on the ship we’re up against, and by process of which we open up our weaknesses. To mix metaphors a little—once you enter into a poker match, you are faced with a decision on how best to utilize your wood (that is, your good hands). Do you choose to use your wood to strengthen your fortress, or are you going to go out and use that wood as a battering ram? Ultimately you must do either one or the other. And we might describe the best players as being able to best use the wood they have to either optimally reinforce their fort, or to optimally use as battering rams. All wood is created equal, but not all wood is used equally. I have been very philosophically minded in many of my explanations thus far. But I don’t want to leave you only with ideas. I want you to think about how to put these things into practice as well. Of course, there’s a sense in which all I can really teach you is ideas. But I can also point you toward the path to putting these ideas into effect. When you conceive of a real poker match—and for the purpose of simplicity, let’s imagine it’s a match against only one opponent—how do we put these ideas into practice? How does this perspective demand that we think, and where does it come into play? This is a difficult question of course. And it’s difficult for a few reasons. For one, it’s likely that you don’t actually know that much about how you think about poker. People in general tend to know very little about the processes of their own cognition, although they are often inclined to think that they do. That’s a cognitive fallacy that we’ll look more into later. But the second reason why it is a tough question is that it *is *genuinely difficult to put the aforementioned kind of perspective into practice. But let’s at least try to see what it looks like. Imagine you’re in a spot, say on the flop or turn. You have a hand—but it doesn’t actually matter what you have, because in this kind of thinking your hand doesn’t actually matter. Remember, what we’re thinking about is your range (in other words, the entirety of your handrange and overall strategy). So the central question is this: how do we want to arrange our ranges so that we’re best exploiting what we think his range is? The question is easier to pronounce than it is to follow its thread to the end. But there are a constellation of things that it forces us to consider: first, what weaknesses in our opponent’s game can we exploit? Where is he allocating his good hands? Where are his good hands missing? Inherently, this question requires you to integrate all of the information you have about this opponent, through which we can narrow down his hand ranges eliminatively, and it also includes your psychological profile of your opponent, as well as general patterns you’ve noticed in how he plays his good hands. Remember, the art of building a ship is the art of allocating good hands. This means that we want to be following his good hands as closely as we can, paying the utmost of attention to them—because in fact, everybody gets dealt the same amount of them. We must trace his good hands with our eyes, as though they are magnets moving through a field of iron shavings, imprinting the skeleton of his game—that is, his good hands will show us where his game is strong and fortified. Wherever he is extending himself away from that skeleton, that is where we know he is weak, and that’s where we want to be attacking. For example, if somebody is using all of his good hands on the flop by checkraising them and playing them fast, and in this hand he hasn’t done so—then you know here on the turn you should be battering him, because his structure is inherently weak here. You therefore want to construct your ranges so that you’re attacking him in this spot, and losing as little as possible in situations when he’s checkraised you. It’s a simple example of course, but it gives you the idea of this sort of holistic top-down view of the game. There’s probably a good chance that you find all of these conclusions pretty intuitive. In a way, my project begins with telling you what you already know. But in understanding it in this different way, using more precise language, you may gain clarity and insight that you may not have had before, and we may use that language to build toward bigger and more complex ideas. Next we are going to look at a more advanced concept in poker. Note the following diagram. Imagine this rectangle is a map of poker. This rectangle represents the field of possibilities, and every point on this rectangle represents one possible sequence for a poker hand that can take place. The circle in the middle represents 99% of all poker hands. Yet, you will notice that the circle doesn’t cover 99% of the rectangle. This is because the circle represents not 99% of all the possibilities, but 99% of possibilities by frequency. That is to say, if we were to enumerate all possible hands that can be played in poker, the range would be astronomically large. But if we were to enumerate 99% of the most commonly played hands or types of hands, they would be relatively easy to contain. This is partly because so many hands end on early streets and are therefore less complex, but also because most hands are not very exceptional and essentially play themselves—by either c-betting, or flopping a hand so good or so bad that your decision is simple. So we can think of this as a probabilistic map, shaded so that the places of highest frequency are darker, and the lowest frequency is lighter. You will notice a thin veil of light-grey encompassing the rest of the map. This is because the remainder of the field of possibilities is very rare, comes up uncommonly, and is randomly distributed outside of the normal field. For the most part, most things that happen fall within the 99% circle. This is a concept which I call centrality. Centrality is the measure of how close to the center of the probabilistic map a certain situation or hand is. Or, even more simply, centrality is how common a certain spot is. A spot that is highly central would be something like 3-betting light preflop—it is a decision that is made a great many times a session, which makes it very central. A spot that is very non-central would be something like 3-bet bluff-shoving the river to represent a rivered runner runner straight. It’s a situation that probably doesn’t even arise once every two thousand hands, and so it’s tremendously rare and non-central. 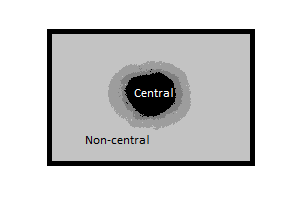 Now, what important differences are there between central and non-central spots? For one, any spot that is highly central is going to be easier than one that is non-central. If the spot is central, then it is one that most players have been exposed to so many times that they understand the dynamics of that spot fairly well. Therefore, most players play pretty well in spots that are highly central. On the other hand, in spots that are non-central, people are more likely to make mistakes, since they inherently don’t have as much experience in non-central spots. A corollary of this, which is an important principle of poker, is this: people will only be good at what they need to be good at. You can think of this as a kind of natural selection within poker: an evolutionary principle. It means simply that if your opponent has never had to be good at doing a certain thing, then he won’t be. People only develop the skills they need, and generally speaking, nothing more. This is a simple point perhaps, but an important one. To bring it back to centrality—any spot that is highly central is a spot where there’s less room for you to exploit your opponent, because your opponent is naturally going to have a more robust strategy. This is simply because your opponent has, just like you, faced this spot so many times that he has had to have a good strategy in order to survive until now (again, the evolutionary principle). For example, five years ago, 3-betting light was an enormously powerful strategy, because it was a very non-central; few people had experience against it and knew how to deal with it. Poker players literally did not need to be able to deal with light 3-bettors, and so they weren’t good at it. But by now, five years later, 3-betting light is so common as to be trivial, and everybody has dealt with it so much that they’ve arrived at near-optimal strategies. The truth is, preflop game is pretty simple. Since it limits poker to only the first street, which is inherently the simplest, it leaves the least room for complexity, and therefore the least room for maneuvering, mistakes, and exploitation. You are not likely to be making much money in preflop game, because it’s highly central and everybody is pretty good at it by now. So there are two major implications that follow from this. The first is that if our poker match stays within the circle of centrality, we will diminish our chances to exploit our opponent, since we are inviting him into a space where he’s very comfortable, and naturally has a robust strategy. But by leading him intentionally out of the circle of centrality—by taking him into a terrain with which he’s unfamiliar, we allow the possibility for bigger mistakes. This is why players who have very unconventional styles, even ones which sometimes seem distinctly suboptimal, are sometimes dramatically winning players. Part of the reason why they might continue to be successful is because they jostle their opponents out of their circle of centrality, while still remaining in their own circle of centrality. Imagine the stories of Native Americans fighting cowboys in the forests—the Native Americans might have be pitting mere bows and arrows against the much more deadly guns, but the fact is that by fighting on terrain they know and their opponents don’t know, they were creating many more opportunities for their opponents to make mistakes which they themselves wouldn’t make. In fact, not only were they less likely to make mistakes themselves, but because they had experience fighting against people who weren’t experienced on their terrain, they were good at predicting what kind of mistakes their opponents would commonly make. Even in poker, it is not uncommon to play against someone who has such a peculiar strategy that you immediately assume that they are a fish. You might, after some time, realize that they’re actually fairly intelligent postflop, and you may even discover that you’re having trouble beating him. These phenomena are essentially the same. To beat somebody with a very unconventional or non-central style of play, one powerful strategy is to explore his forest of centrality, acquaint yourself with the terrain, even if you make some missteps along the way. Once you learn the landscape of his style, your inherently more powerful gun will defeat his inferior bow and arrow, but you can only get to that point if you have the patience and foresight to understand that process, and not let yourself get frustrated and make needless mistakes along the way. You may notice, however, that this strategy is somewhat passive. It simply acquiesces to the space of our opponent’s choice and tries to optimize within that space. That is in fact only one mode of dealing with centrality. We will call that mode the reactive mode, which simply tries to adapt to the space your opponent has pushed you into. Most “grinders” tend to play this way. But the second mode is the proactive mode, which actively moves around and tries to search for non-central spaces in which to challenge its opponents. Poker players who prefer this mode tend to be more aggressive, risky, and creative players. I will explore some of these ideas in more detail later in the chapter on creativity and fear. It is important to remember, however, that centrality is relative. What is central to one player may not be central to another. Centrality is defined by probabilistic frequency, so if two players have vastly different styles, then chances are, what is frequent in one player’s game will be infrequent in another’s. For example, if one player minraises preflop and always tries to play small pot poker, and another player is used to 3xing and doing lots of overbetting postflop, it is likely that each of them will be pushing the other into non-central spaces. Centrality is also contingent on complexity and other player-dependent factors. For example, cold 4-betting when an aggressive button 3-bets may be a relatively central play in a 6-max game. Because it is central, we can assume that people can deal with it and will respond relatively well on average. But if instead you cold 4-bet when a less predictable bad player 3-bets, that may be a non-central play, and it’s something that other players might be unsure exactly how to interpret. Complexity and rarity tend towards non-centrality. The second aspect of centrality is a psychological one. Remember before that I claimed spots within the circle of centrality are easy. But what exactly does it mean for a spot to be “easy”? This is actually a tougher question than it sounds, which I will go into more detail about later. But for now we will say that “easy” hands are ones that don’t require a lot of psychological processing in order to make a decision. That is to say, they are mostly automatic and subconscious. A spot that is highly central is one that’s easy, which means your opponent will be processing it mostly unconsciously. This means he won’t be paying much attention to highly central spots. He knows he’s solving them with relatively high efficiency, so he’ll be focusing his conscious attention elsewhere. Non-central spots on the other hand will have the opposite effect. Once your opponent runs into a non-central spot, he’ll be shaken back into conscious awareness. His autopilot will turn itself off, so to speak, and he’ll retake his place at the cockpit to make this decision. This has an important implication for us in the psychological game. Knowing where your opponent is paying his conscious attention is vital. If you can tell where your opponent is paying attention and where he’s not (strategic and speed-reads come in handy here), you can better predict his reactions. In central spots we can assume your opponent is going to be cognitively autopiloting, and your general read on his style and character will be applicable. I.e., if he’s somebody who does too much of x or tends to do y, you can fully expect this behavior to present in a central spot. But once a non-central spot arises, your opponent is going to change psychologically. If you think about it in another way, his autopilot is essentially a pre-calculated program. It’s a set of algorithms that have been formulated by his past and all of the conditioning that he’s been through, and he trusts it when it applies. But once he reaches a new spot where he has to focus his attention, he’s going to re-integrate and re-invent a solution to the new spot he’s facing as though he’s never faced it before, using his poker theory and reasoning. But this onlyhappens when he has focused his conscious attention on this new hand. What all this means is that your opponent is likely to deviate from his normal psychological and strategic character in a non-central spot, and is instead going to be acting on a new theoretical analysis, based on nearby available psychological and strategic data in his match with you. Central and non-central spots are processed differently, and understanding this will allow you to predict what would otherwise appear to be psychological anomalies. Let me illustrate with an example. Let’s imagine you’re playing a match against a thinking opponent, but someone who is generally somewhat of a calling station and doesn’t like to fold. So far, every time you’ve shown down in a big pot, you’ve had a good hand. What we can say is that generally speaking, he will probably retain his style of being a calling station and playing the same way he usually plays in central spots, because that’s his automatic game. But once you move into a non-central space, suddenly he will be jostled awake. You might make a big bet to the river, and you can predict that at this moment he will be forcedto re-think over this hand. If you are attentive, you will notice all of the nearby information that he’ll be integrating—that you’ve only shown down good hands—and you can predict he will think to himself “oh, this guy always has it,” and make a big fold. That fold might appear to be uncharacteristic and unpredictable by someone who doesn’t understand this concept, but good players are able to predict this sort of thing accurately. They may not use these words (or even be able to articulate the process behind it), but this is what they are doing. By being aware of the difference between the automatic and subconscious decision-making in central spots, and the explicit and deliberate thought that goes into non-central spots, you’ll be able to predict otherwise unpredictable moves. That is the power of centrality. As a final caveat, it’s important to keep in mind that centrality is, at best, a principle to keep in mind. The adjustment game hinges on a lot more things than the concept of centrality, and a strategy that literally only consists of trying to push people into non-central spaces would probably be what most people call maniacal. Rather, centrality is simply a way of understanding some of the dynamics that underlie adjustments, aggression, and comfort, which are all important elements of the adjustment game. With centrality, we have already breached well into the realm of holistic poker thinking. The landscape of holistic poker theory is populated by many familiar big ideas, such as balance, exploitation, game theory, and so on. But to really be able to examine and manipulate these concepts, we have to understand them deeply. One of the biggest concepts that intermediate players tend to misunderstand is the concept of balance, so I will explore it in depth. Let’s pose the initial question. What is balance? We might start by saying that it’s basically the idea that you need to balance your bets with both bluffs with value hands. That’s not a bad start, but it turns out there’s a lot more to balance than that. The truth is, the word “balance” as it is used in poker discourse is something of a fuzzy concept, which people often use to fill holes in their poker thinking. If you ask somebody “why are you checking back a set here?” or “why are you betting middle pair?” or “why are you bluffing this river?” many times the confused mid-stakes player will answer that it’s for “balance.” But if you press him on a definition, he won’t be able to tell you exactly what that means. It’s strange, given how liberally the word is thrown around, but for our purposes it is essential that we dissect this concept. Balance is by its nature somewhat fuzzy, but the way it’s used, it boils down to two basic ideas. The first idea is that in order for a range to be balanced, it must contain both value hands and bluffs. The second is that in order for a range to be balanced, it must contain both nutty and medium strength hands. It is said then if you have too much of one and not enough of the other, that you are imbalanced in that spot. Now, let’s look carefully at this definition. What exactly does it mean to say that a range must contain both value hands and bluffs? How many of them? Is one bluff per 100 hands enough? It’s here that the concept of balance gets tied in with the notion of unexploitable play. Unexploitability is a concept from game theory, which simply means that our strategy cannot be exploited by any other—that is, it can never lose to any other strategy. For example, if we take the game rock-paper-scissors, the unexploitable (also called GTO, game theory optimal) strategy is to randomly play each move exactly 33% of the time. This makes it so that no matter what your opponent plays, he will on average be breaking even against you. Many poker players end up equating balance with unexploitable play. By this what I mean is that they think in order to be balanced, their range must be completely unexploitable, or what we might call “perfectly balanced.” This would mean something along the lines of intentionally creating a range where you’re bluffing 33% of the time and valuebetting 66% of the time when you pot the river when a draw misses (which would make your opponent’s EV for calling a bluff-catcher exactly 0). On its face, these concepts all sound grand and attractive enough and it certainly makes us want to think they’re going to solve our problems. But there are two great fallacies in most people’s understanding of balance. The first fallacy is the assumption that balance is all-or-nothing. That is, that you’re either “balanced” or “not balanced.” The second fallacy is thinking that balance is inherently valuable, when in fact, it isn’t. Let us begin with the first. Balance is not all-or-nothing. That is to say, your ranges don’t need to contain an unexploitable proportion of value hands and bluffs in them, and nor do they need an unexploitable amount of nutty hands in them. The reason why this is the case is because of imperfect information. In a real poker game, your opponents are going to get information about the actual hands that comprise your range very, very slowly. Think about it—your opponent only sees one hand per showdown, and most hands are never shown down in poker, not to mention a hand that shows him exactly what’s going on with that part of your range—it may be hundreds of hands until he sees another hand of a relevant situation. So because information is gleaned so slowly for highly specific ranges, there are a lot of your ranges which for any given match will remain totally hidden, which means you can essentially do whatever you want until your opponent catches on and adjusts correctly. But there is more to it than that. Information in poker is not only imperfect, but it is also imperfectly wielded and responded to. For example, even if your opponent starts catching onto you in a bluffing spot, you don’t need to show that you have “enough” nutty hands in any given range to get him to respect you again. All you need to do is have some, even a small amount. What I mean by this is that if your opponent suddenly sees you show down the nuts in an uncommon spot where you’d been bluffy before, he’s not going to attack that part of your range anymore because he’s likely to assume that you’ve enacted a large-scale adjustment, overgeneralizing from your most salient plays. Instead of thinking “okay, I’ve only seen the nuts once and 8 bluffs, which makes his range 89% bluffs,” he is likely instead to think that you’ve decided to completely change your strategy, and will react accordingly. The amount of subsequent hands it’ll need to convince him that you don’t have enough nutty hands in that range to be unexploitable is going to be quite large, because of the fuzziness of information and how slowly he’ll be acquiring it. Not to mention the fact that salient impressions (especially initial ones) are psychologically more persuasive and impressive than slowly accrued data. So if you think about it carefully, given how slowly your opponent will be gathering information about most spots, he won’t be able to ascertain your true frequencies very precisely. If he sees a spot four times in 500 hands, and one time you had a bluff and three times you were valuebetting, you might make the assumption that your opponent would assume that you have a 25% bluffing range. But think about it—if you see a coin flipped 4 times and you get 3 heads and 1 tails, do you automatically assume the coin is rigged? Poker players will often try to balance their ranges, and because of that, forego playing exploitatively. This is symptomatic of a cognitive fallacy that is more widespread, which is one of the biggest mistakes that a poker player can make. It is what I call the fallacy of omniscience. The fallacy of omniscience is when you assume that your opponent knows everything you know, or sees everything you see. Let’s take for example a highly non-central spot. Say we’re in a spot where we’re considering 3-bet bluffing somebody on the river to represent a runner-runner straight. Now, you might be sitting there, thinking over this bluff, and you might think to yourself that in fact, you never would have a straight here in this spot because you would have check/raised the river, or you would have done something else with it on the turn, or whatever. And so you think to yourself, it’s irrational here to bluff because this isn’t how you would play your actual hand. This is an instance of the fallacy of omniscience, because you’re assuming that your opponent knows everything that* you know* about your own game. The fact is, even if he has seen all of those things, he may not assume that you always play your backdoor straights that way. He might not have even had the chance to see those things about your game yet. Or he may not have even noticed them even if he saw them. He may have even seen them but forgotten them. There are many stages of the transmittance of information in between what you know and what he knows, and a failure to navigate and consider those channels of information is a very big mistake that’s going to cause you to forego a lot of valuable bluffing spots. So all this is well and good, but it leaves one important question un-answered. The question is this: why is balance important? The word “balance” is a relatively recent arrival in the vocabulary of the average poker player. It wasn’t that long ago that balance was simply not talked about. But imported along with the concept of balance, there is a certain presumption that has found its way into many people’s poker thinking. The presumption is this: that balance is inherently valuable, and desirable. That is, that it’s better to be balanced than imbalanced. I suspect that this presumption is derived in part from the association between being imbalanced and being exploitable. Being exploitable is not the same thing as being exploited. Remember when I said that in order to attack, you must create a hole in your defense? This is true in poker, as in everything else. In order to be exploiting somebody, it must be possible for your strategy to be exploited as well. For example, say your opponent is bluffing far too little in a certain spot. In order to exploit his strategy, you never hero-call, since he almost always has it. This occurs to you as the natural adjustment of course, but in terms of game theory, you are becoming exploitable in order to exploit him. If you are now folding 100% of your bluff-catchers, then you are inherently making it possible for him to exploit you by simply bluffing 100% of the time. Of course, that sort of thing doesn’t happen in a match, which is why you’re okay with doing it. But the point is that there’s nothing bad about being exploitable. One must be exploitable in order to be playing well and adjusting to one’s opponent. So let’s return to the original presumption. The idea that balance is inherently valuable is tricky, and we want to be careful about it, because it relates very closely to the notions of exploitability and unexploitability. To be unexploitable means that it’s impossible for our opponent to take advantage of us—meaning simply that it doesn’t matter what strategy he takes, our EV will be the same. Recall the rock-paper-scissors strategy of randomly throwing 33% of each. In essence, it makes a part of our game unassailable. Metaphorically speaking, you can imagine that playing unexploitably is like boarding up a part of your ship so that it will be impossible to attack it. But by the same token, you are no longer able to attack from there either. There is nothing going in or out. By playing unexploitably in a certain spot, you are not necessarily improving the strength of your game, but simply excluding it from the battlefield and making the scope of the game smaller. Now, you are probably well acquainted with the term optimal, but optimality has a very specific meaning in terms of game theory. To be optimal means to be maximally exploiting your opponent (or in other words, to maximize your own EV). To play optimally necessarily means not to play unexploitably, since you cannot exploit someone without being exploitable yourself. Therefore, in a vacuum, to play unexploitably against a human opponent is to choose a suboptimal strategy. Now, you might wonder—if it is literally never optimal to be playing unexploitably and perfectly balanced… why do people think you should? Why is balance so important if it’s never optimal? Well, here is the rub. If your opponent is playing unexploitably and perfectly balanced, then by definition, your strategy doesn’t matter (so long as you’re not doing something dumb like open-folding), because your EV will be the same regardless of what action you take. So you could just do anything you want as long as you were getting to showdowns, and your EV would be the same. However, intuitively that doesn’t seem right, does it? The reason why that doesn’t seem right is because poker is not played in a vacuum. Poker is played over time. Instead of looking at poker synchronically, or at one moment in time, instead we want to look at poker diachronically, or over a period of time. So for a single hand, it’s true that if our opponent is playing unexploitably such that our EV for each hero-call is 0, that it’s fine to never hero-call him, or to hero-call him 100% of the time. Mathematically that’s true, since 0 multiplied by anything is still 0. However, that doesn’t take into account the change of the match over time. Once we start hero-calling our opponent 100% of the time, our opponent is likely to see that, and react to that information by deviating from his unexploitable strategy into an exploitative one, such that he stops bluffing altogether. This would make our EV dramatically negative and his positive. If you think about it, his unexploitability—his balancedness—has created for him a stronghold from which he can choose how and when to attack, how and when to open up his portcullis of exploitability, as he gains information. What that really means is that balance and unexploitability is a defensive strategy. It is, in a sense, a way of safely biding your time. Another reason why unexploitability is a valuable defensive strategy is because of the fact that humans have limited attention. There is a common and widespread psychological fallacy that people commonly commit, poker players not omitted. They often assume that because something is presented in front of them, that they will always react appropriately to it. Ironically, when looking at other people, you will often factor into your assumptions the chance that they miss or incorrectly evaluate information, but you rarely consider this about yourself. The fact is, over a poker match, you are faced with innumerably many frequencies and patterns in your interactions with one opponent. You are faced with his preflop raising ranges, his 3-betting frequency, his flop c-betting percentage, the different ranges of hands with which he c-bets and checks back, the frequency with which he checks monster hands, the ranges that accord to different flop betsizes, and so on. The reality is, although all of these things are there to be perceived, you don’t immediately perceive all of them. Your attention is limited. There are only certain things that you can actually focus on and play the adjustment game around, and the rest you just throw away, so to speak. Even the certain things you’ve chosen to focus on, you don’t react to perfectly all the time. If you imagine the ship analogy, it would be silly to open up holes all around your ship, even if you had a cannon for each of them. This is for the simple reason that you can only focus on so many of your own cannons, and you can only watch over so many openings at once. You are, in the end, the only crew member on this ship. So you must plan around that! Keep your ship fortified where your attention cannot reach, and in the places that your attention is active and continual, that’s where you want to be playing exploitably and opening yourself up to attack. So because of the fact that your own attention is limited, it is a valuable defensive strategy to try to play unexploitably. Now, I’ve given you all these reasons as to why balance is a good thing, and it clearly is. And yet, I told you that it’s wrong to presume that balance is always desirable. Let’s think about this carefully. If balance is good, and clearly it often is, then it must contribute EV to our game. So let’s try to pinpoint exactly where that EV comes from. Imagine a spot where you’re the preflop raiser, and you flop trips. You decide to check the turn because you want to balance your bet/check/bet line, instead of bet/bet/betting. Where does the EV of your balancing actually come from? But be careful—that’s not balance, that’s inducing a bluff. While it’s true that many spots where you might rearrange your ranges for balancing may induce bluffs, and may even be as a consequence the optimal play, that has nothing to do with balance. Let’s imagine that we worked out this opponent’s tendencies, and calculated that he’s somebody against whom bet/bet/bet would be slightly more +EV on average than bet/check/bet in this hand. So mathematically, if balancing is superior, it must give us some other EV external to this hand. Where is that EV supposed to come from? The answer is that the EV for balancing is realized not synchronically, but diachronically. That is, it’s not realized over one hand, but it’s realized over an entire match. Think about it. If taking a bet/check/bet line here allows you in the future to be able to bet for value a thinner range on the river, since your bet/check/bet line is balanced by having trips, then your opponent is going to checkraise bluff you less. Not only does it let you valuebet thinly more effectively, but it allows you to bluff effectively with the bet/check/bet line. You might notice that capturing this EV is contingent on the situation popping up again before the match ends. Because the EV of balancing is realized diachronically, balancing only has value over the course of a longer match. If you are playing somebody for 10 hands, chances are balancing is going to be worthless unless it’s synchronically optimal. There’s a second factor as well—if your opponent isn’t aware of the fact that you’re balancing, then your balance isn’t netting you any EV. That is, if your opponent isn’t observant or aware enough to notice that you’ve included trips in your bet/check/bet line, then you’re not going to get any EV in future hands from it. Against somebody who is essentially unaware of what is going on, you are better off playing each hand optimally synchronically. So balance is only valuable in and of itself against people who are aware enough to perceive and respond to your balance, and who you’ll be playing for long enough for it to matter. We can see that there are certain times when balance isn’t very valuable, and certain times when it is more valuable. It falls along a spectrum; balancing isn’t always preferable to not balancing. So to sum all this up, we can state final theorem of balance: one should balance if and only if the EV of balancing averaged over the session (diachronic) is greater than the EV you gain by playing the hand optimally in a vacuum (synchronic). Of course, sometimes playing the hand balanced is also playing the hand optimally, as in the case of a bet/check/bet line against somebody who’ll bluff the river a lot. But in cases where the way to optimally play the hand is not to balance, you must consider your EV carefully. Balance, however, isn’t limited to distributing hands among different actions (as in between betting and checking). There is also balance in bet sizing. Most people tend to think of this as a separate arena for balancing. If you consider balancing bet sizes a separate game, you’re likely to find the task overwhelmingly daunting. But in fact, we can simplify matters. What does it mean to balance bet sizes after all? It simply means that each individual bet size needs to be balanced independently—that is, it just means you have to treat each bet size as its own range. If you only have one bet size in a certain spot, that may present itself as an easy task, but there are many spots in which you’ll have more than one “go-to” or predetermined bet size—though none of us is ever going to use every possible bet size. In any given spot, generally you will have two or three predetermined bet sizes, but rarely any more than that. If we simply imagine a bet size as simply being a different action from another bet size, then we can extend the previous line of argument to come at a theory of balancing in bet sizing. Here’s an example. Imagine that you 3-bet your opponent preflop and he calls, the board runs out KsQs5d3d7h and you barrel every street. You may have three different bet sizes on the river: three fourths pot, which is your standard and includes top pair for value; an overbet which includes nutty hands for value like twopairs and sets; and a smaller bet that includes only AQ-QT value. Other than those value hands, those ranges would be populated solely with bluffs, and each with a different proportion relative to the whole. We could decide to achieve perfect balance in each range by doing some simple math with the pot sizes, and achieve a mix of bluffs and value that would be unexploitable for each range. But is that really what we want to do? We are faced with the challenge of balancing over three ranges instead of one. How do we decide how to balance this? First, let’s remember the fundamental theorem of balance. You should use a hand to balance a bet size if and only if the EV of the effect that hand has on your bet size averaged over the session is greater than the EV you gain by sizing that hand optimally in a vacuum. Keep in mind, in order for bet size balancing to be useful, you must ascertain what your opponent is paying attention to. If he is simply ignorant, inattentive, holding onto presumptions (or not gathering any information by folding every time), then there is little need to balance, because your balance won’t be affecting his future behavior. There are obvious examples, such as when you’re playing a super-fish, but there are also more subtle ones. There are some good opponents who will never call 1/3 pot sized bets on certain rivers because they assume you’re always going for thin value, and some opponents who will never call overbets on certain run-outs. Because your opponent is getting almost no access to that information, and because he’s likely to cling onto his presumptions about how people play those spots without paying attention to your actual style, you are often free to play utterly exploitatively in those spots. But in spots that are highly visible (and in matches of sufficient length), balancing bet sizes becomes more important. But ultimately there is another level of complexity to choosing bet sizes. Balancing between betting and checking is a simple binary decision. But how do you decide how much to bet? This is another question of holistic thinking. We’ll start with an example. We’re 100bb deep, we 3-bet our opponent preflop, he calls, and flop comes out A23r; the pot is 20bbs. For simplicity, let’s say that in this case we’re only going to choose one bet size for our entire range. We could choose 5bbs, 10bbs, or 15bbs. How do we make that decision? In this case, it is by pondering this question: what does this sizing allow us to do with our entire range? Remember, at any given time on this board we might have KK or AQo or 79dd, and in each case our natural inclination will probably be to choose the best bet size for that specific hand. But in order to balance effectively, we must think holistically. Instead of thinking about what’s the best bet size for our hand, we must think: what is the best bet size for my *average *hand? In other words, how much work does the bet do over all the hands I’ll have here, rather than just the hand I have here now? In this specific case, the answer is usually going to be close to 5bbs, since it’s a WAWB (way-ahead/way-behind) type board, whereas on a much drawier board on which your opponent is more likely to have significant equity you would bet bigger and less often with your entire range. But this can depend on a constellation of things, most importantly, how foldy your opponent is to different bet sizes, which is something you should always be probing and experimenting with. This leads us to the last big idea, which is the art of bluffing. Bluffing is something that every poker player thinks they know how to do. But there are subtle aspects to bluffing that are not understood by many players. The first concept of note is bluffing equity, which is the equity you get from being able to bluff on a later street. If you imagine somebody who’s dealt two napkins—that is, who literally has cards that can never connect with the board, that person can still win pots, and possibly even beat some really bad opponents. All of that person’s equity is coming from his bluffing equity, or his ability to win pots with bluffs. Bluffing equity is important to consider, because sometimes bluffing equity is a valuable reason to stay in a pot rather than fold out early. Many poker players never think about this, but a negative EV decision on an earlier street may become positive EV from profitable bluffing situations that may appear later on in a hand. It’s actually analogous the concept of implied odds. According to implied odds, a negative EV decision on this street may become profitable by the likelihood of making money on the next street. Bluffing equity is the same—you may continue in a hand that’s slightly negative EV because a good bluffing opportunity may appear on the next street. Of course, people are much less comfortable using this justification for a play, because they feel really sure about the positive EV of being able to hit a straight or trips, but the positive EV of a bluffing spot doesn’t feel as solid to them. They’re more afraid of having to rely on it. But really, EV from value hands and EV from bluffs are the same—EV is EV. But there is an important caveat here. In order to use bluffing equity as a justification for a play, you have to be sure that the bluff you plan to do is going to actually work, i.e., you have to hand-read really well and know how your opponent thinks. Therefore, if you’re a confident in your reads, then your true bluffing EV is going to be closer to your projected bluffing EV, but if you’re not confident in your reads then your actual bluffing EV might not be close at all to what you projected it to be. So for a confident player it might be a good idea to rely on bluffing equity, but if you’re less confident player then you should be more careful of using bluffing equity as a justification for immediately –EV plays. Ironically, people rarely if ever consider this when it comes to implied odds. People will chase sets and draws, under the unexamined presumption that if they hit it their opponent will pay them off. But in reality, many players never acknowledge the fact that their opponent rarely pays them off when they do hit, often because their own bet sizing or nittiness is tipping their opponents off. This is a vestigial habit from early on in a player’s career. That is, it is a left-over behavior that many players learn when playing low stakes (how to set-mine and try to hit draws, fully expecting to get paid off) that doesn’t get adequately extinguished once they move up to tougher games. Given how poorly the brain intuitively responds to probabilities (that is, the brain is very bad at getting subconsciously conditioned by odds of ¼ or smaller), it is no surprise that this vestigial habit would transform into such a widespread mistake among poker players. I will be talking about vestigial habits in more detail later. But in summary, these players would do well to incorporate more use of bluffing equity in their game. Cases like these actually show how fundamentally similar bluffing equity and implied odds really are. Just as how implied odds can actually become reverse implied odds, the chance of making a hand we can’t get away from that loses us even more money, we can have reverse bluffing equity. Say for example that we’re staying in a hand with a nut blocker, planning to bluff hard if the flush draw hits, because we believe he’d never play a draw of his own the way he has. Well, in the instance that he actually decided to play his own draw softer than we expected, we are setting ourselves up to lose even more money if the cards we’re planning to bluff on hit. In short, you should always be taking stock of how accurate your reads are, and the less accurate they seem to be, the less you should be veering from immediately profitable plays. Now, there couple of basic principles of bluffing that are not very well understood by most people, so I want to discuss them briefly. The first I’ll pose as a question—when you want to bluff someone, what kind of hand do you want to represent? Most people will intuitively answer “a strong hand.” This is exactly the wrong answer. If you think about it, your opponent doesn’t actually care whether or not your hand is strong. What he cares about is whether or not his hand can beat yours. That is to say, you need to represent a hand that’s better than his. So if he has a mediocre hand, you don’t need to represent a strong hand. You just need to represent a hand slightly stronger than his, even if it’s also mediocre. This is a common fallacy that poker players make when thinking about how to bluff. They concentrate their bluffs in places where they can represent flushes and straights, sets and overpairs and hands of that nature. But inherently, all of those hands have a very low absolute frequency. You don’t get flushes and sets very often. So why try so hard to represent them? Instead, these players should be trying to represent more hands like top pair low kicker. Hands like second pair value betting thin, or a medium pocket pair. They should be using more bluffing lines like check/check/bet, or check/bet/bet, or bet/check/bet, which inherently represent these weaker types of hands. These hands get dealt with a lot higher frequency, and so they are able to bluff to represent them much more often. You don’t tend to win as big of pots by bluffing in this way, but the pots you are going to win will add up dramatically in the long run. Winning one extra 10bb pot per 100 hands amounts to a dramatic increase in winrate. Now, the second principle of bluffing is a more advanced one, and hinges on knowing how your opponent thinks. But let’s assume that your opponent is fairly intelligent, and is actively thinking about your ranges. Let’s say you’re in a spot where you shouldn’t have any hands that don’t have showdown value. As a general principle, most people (when they think about it) will assume that you are going to choose the path of least risk—which, by the way, is generally a good assumption. So since they know you can probably just check through and at least occasionally win without risking anything, they will assume you’re not going to turn those hands into bluffs. They will then usually put your bluffing frequency at zero. Therefore, this is a spot where you should be bluffing. To give a more concise statement: in spots where your opponent thinks you shouldn’t have any need to bluff, you should bluff. Of course, I must disclaim this with the fact that this is only valid when your opponent is thinking about things like this, and the spot is salient or non-central enough for him to be consciously thinking about it. So you can see there many more subtle aspects to thinking about bluffs than simply representing a big hand once in a while. There is a tremendous artistry and nuance to it that will take you a career to master. I’ve shown you all these different perspectives on how to arrange your poker game on the holistic level, but we must next return to the reductionistic level, which is, after all, where all the real action happens. We may think about poker holistically away from the game and when we’re conceiving of match dynamics, but in reality, poker is just hands. It’s played through hands, through decisions, through constructing ranges one after another, and we would be remiss to neglect that. So remember that all of these big ideas must be put into effect into your game, one at a time, all very concretely. Now that we’ve set the foundation for poker strategy, we can look at the next element of poker thinking—psychology, and the art of randomness. Congrats on getting through that!